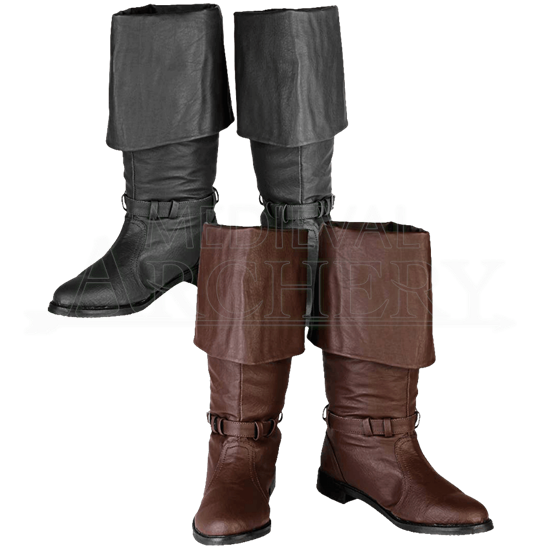 A sturdy yet stylish shoe, the Haddock Jackboots are a fantastic addition to historical reenactment looks and suitable for wear during LARP events. Made of synthetic, weather-proof leather, these boots are ready for anything. The Haddock Jackboots have a versatile design, featuring a large cuff that can be worn either folded down or rolled upwards depending on the needs of the wearer. A high grade foam lining keeps feet warm, while the heavy duty rubber sole and heel help guard the wearer against slips. Straps under the cuff and at the ankle are adjustable for a custom, secure fit. While they feature a historic design, these shoes are rugged enough to traverse through a variety of terrains and uses.